Showing results for tags 'abyssinia'. 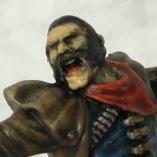 Hi all I'm painting Models for my beloved Store Tactica Games in Zurich / Switzerland. The newest Miniatures are shown at games days like the 8th Tactifaux Tournament including The other Side Game Day for beginner and also for the store window. For The Other Side I've started with the Abyssinia Starterbox. I have used the old Dark Green Ink from Games Workshop for the Crow Runners. What great colours! 😍 Here are my pictures (unfortunately my Attachement is full an I have no idea how to delete the pictures...😟) First painting steps How to make the basing? Difficult... All in the store window! Next step: Gibbering Hordes! The trigger on Lord of Steel's Spear of Ages reads thusly: Open Wound: Immediately increase the Strength of this Action by +1 per in the final duel total. When not in Glory, there is no suit built-in to the stat of the Spear of Ages attack. When in Glory, there is one . The wording on using suits for triggers is listed as below in the rulebook: When a player declares a Trigger, they spend the indicated suit(s) or Margin Values from their final duel total. Spent suits are removed from the final duel total... Therefore, unless you are getting at least 2 , there is no benefit from this trigger. The Machinations Stratagem is the only way I can find to gain another from other models or abilities that I am aware of. So the trigger is otherwise wasted text when not in Glory, and requires you to flip/cheat a when in Glory, aside from playing the Machinations Stratagem. Would this be correct? Strength 5 is still great but if the above is true, I'm not really sure why they wasted the space on the card when not in Glory just to cover for if i) Machinations is taken, purchased and played AND ii) Part of the Plan is used to gain a AND iii) a card is used for the attack. Most of the time I would prefer to use the extra Morale action for each unit granted by Machinations for another Take To The Sky, or for an Interact action. When to discard to pass an activation. I think the ability to pass activations by discarding cards is likely to be a very tactical/playing the player aspect to the game. Since it is likely that Abyssinia is outnumbered as a faction, it is likely they could make better use of this mechanic than anyone. My premise is that Abyssinia would look to get up in VP early and pass activations to diminish the opponent from fully utilizing their numerical advantage. When can you see yourself passing an activation at the expense of a card? What do you like about Abyssinia?